[Vetus Testamentum Multiplici Lingua Nunc Primo Impressum], fourth volume: Quarta Pars Veteris Impressa: Adiuncta Utrique Sua Latina Interpretatione. Alcalá de Henares (Spain): Arnald Guillén de Brocar,  (based on the colophon on the last page). Hebrew, Greek and Latin. Fourth volume of the six-volume Complutensian Polyglot, the first multilingual edition of the Bible, published in four language: Hebrew, Aramaic, Greek and Latin. This volume contains the books of Neviim Acharonim – Yeshayahu, Yirmiyahu, Yechezkel and Trei Asar, as well as three works of Biblical apocrypha – Maccabees I, II and II. The pages consist of three parallel columns, each containing text in a different language: The outer column is the original Hebrew text, the middle column is the Latin translation, and the inner column the Greek translation. In order to facilitate the use of this edition by those not proficient in Hebrew or Greek, superscript letters were employed in the Hebrew text to refer to the relevant word or phrase in the Latin text, whilst in the Greek text, supralinear Latin translation was inserted (in small characters). The composition is accompanied by several fine woodcut illustrations: The coat of arms of the initiator of this edition, Francisco Jiménez de Cisneros, on the title page; ornamented initials for each chapter; and the printer's device on the colophon leaf. 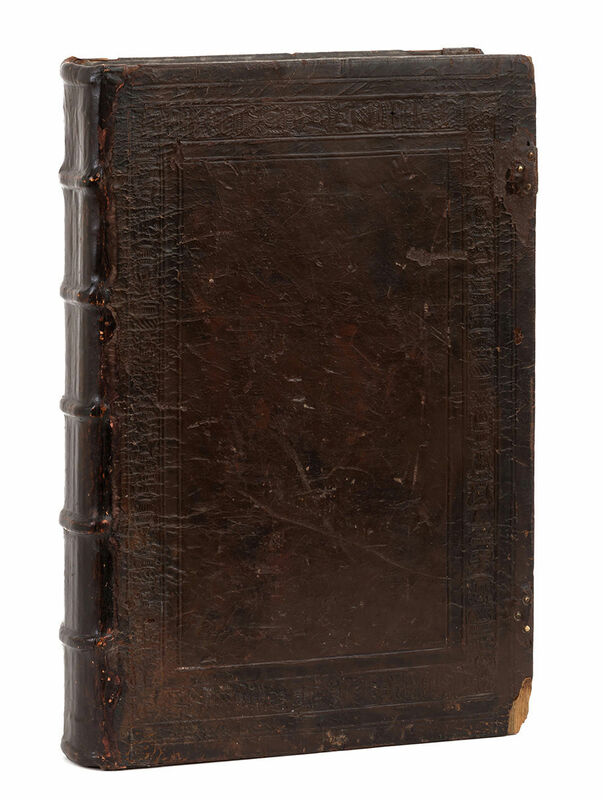 The Complutensian Polyglot, considered one of the most prominent Bible editions in history, was written and edited by scholars from throughout Spain in 1502-1517, with the goal of concentrating into one book the text of the Bible in the main languages. Work on this edition began a few years after the Spanish expulsion, at the initiative of the Grand inquisitor and confessor of Queen Isabella I - Francisco Jiménez de Cisneros (1436-1517). Since most of those fluent in Hebrew in Spain at that time were previously Jewish, Cisneros had a hard time finding editors for the Hebrew part of the edition, and was compelled to appoint three converted Jewish scholars: Alfonso de Zamora, Pablo Coronel and Alfonso de Alcalá. For over ten years, the experts sat in the Spanish city of Alcalá de Henares (Latin name: Complutum, hence the name of this edition), and the work they produced is considered the prototype of Biblical polyglots. leaves. Gatherings: a-z6, aa-oo6, pp4, A-F6, G4, a2. Approx. 38.5 cm. Good condition. Minor stains and damage. Tears and open tears to margins of a few leaves (mostly small tears, not affecting text). One detached leaf. Marginal open tears to first leaf, partially repaired with paper (slightly affecting text on verso), leaf attached to book with tape. Old, damaged leather binding, partially repaired. New spine.